Many people don’t bother to walk over to Skyline Arch, but we always make the short, flat hike. This arch is very intriguing, because it doubled in size about 75 years ago when a large chunk of rock tumbled out. The trail under the arch leads to this rubble. 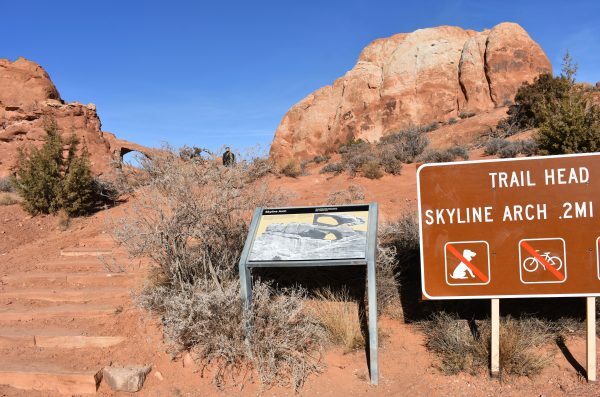 Even if you don’t plan to hike to Skyline Arch, make sure to stop and check out the sign at the trailhead. It shows the arch before it doubled in size, and you get a nice idea of how this slow process can happen quickly. The Arch is beautiful and always framed against the sky, which gives it the name Skyline. 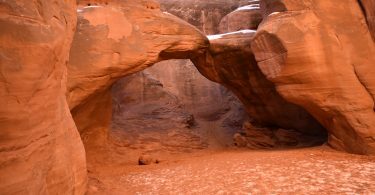 In fact, at the end of the trail, the arch is about 75 feet above your head at the top of an unscalable wall. 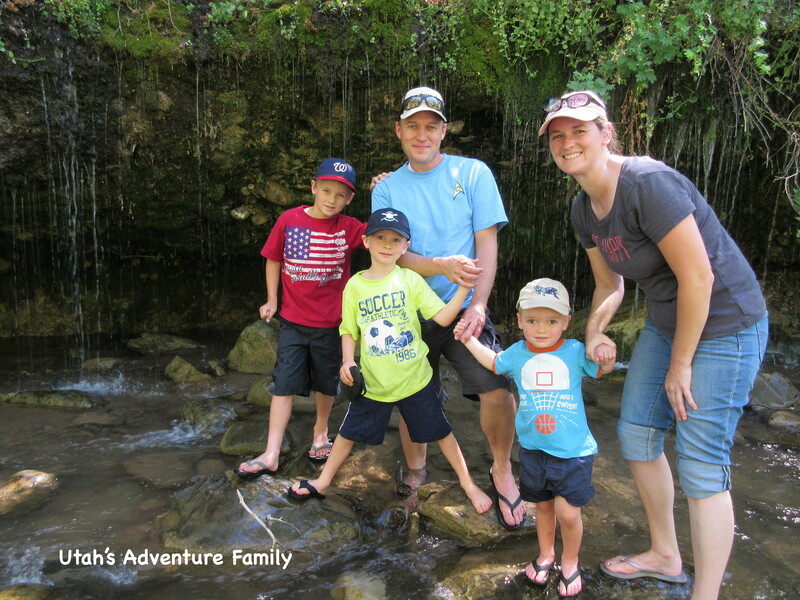 The sign is one of our favorite parts of this hike. 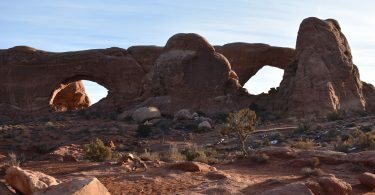 Skyline Arch has a steep wall that is not for climbing. The trail heads east toward the arch, and you can stop anywhere along the trail for pictures. It’s only a 0.25 mile roundtrip to reach the foot of the wall and see the rubble that tumbled out of the arch. Our boys always want to make this short hike. But it would be an easy one to skip since you can see the arch from the road. The trail is an easy walk from the sign. 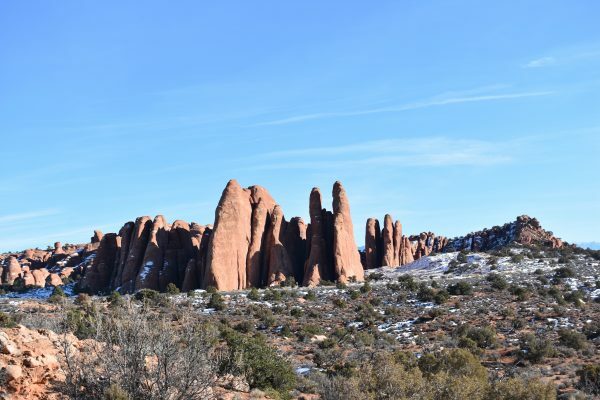 There are beautiful rock formations to see along the way, too. 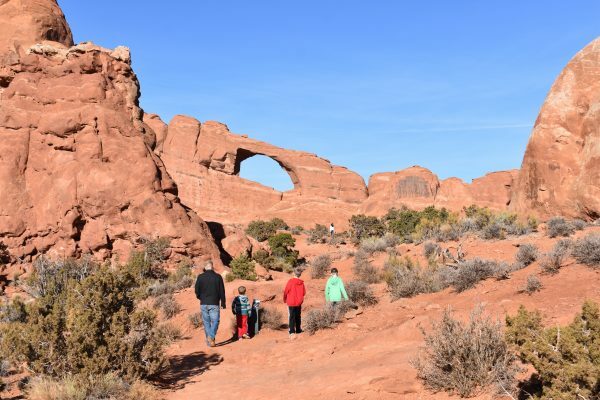 The trail is wide and sandy like all of the trails in Arches. 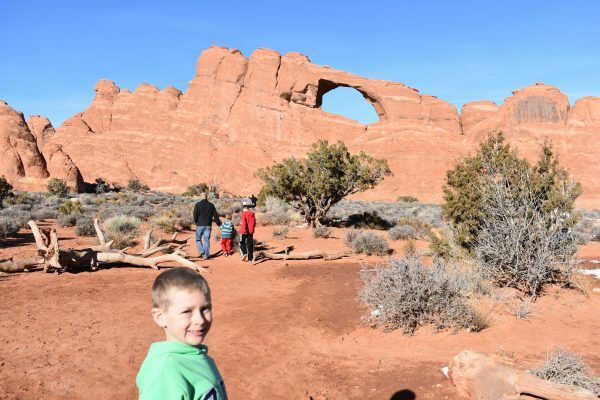 You don’t have to walk far to get a great view of Skyline Arch. 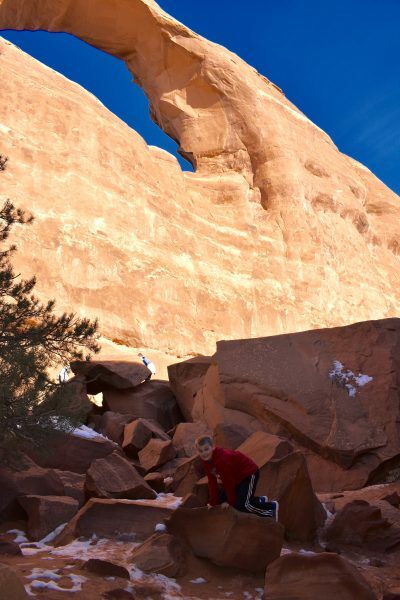 This large chunk of rock is the part of Skyline Arch that fell out about 70 years ago. It is neat to see geology in action. 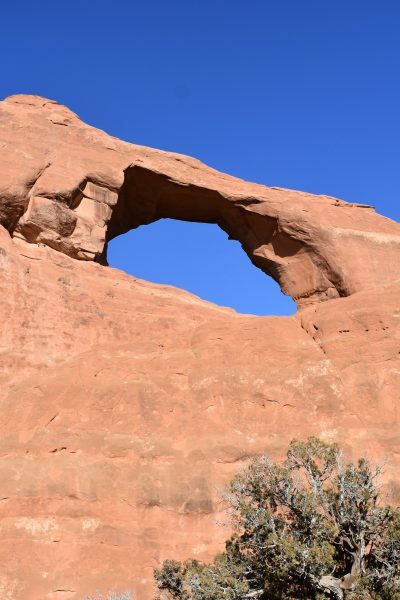 Sometimes when we visit Skyline Arch we see that people have left the trail and climbed up behind the arch. They ruin our pictures, break the rules, damage the terrain, and take a great risk standing in Skyline Arch. So please avoid this foolishness. 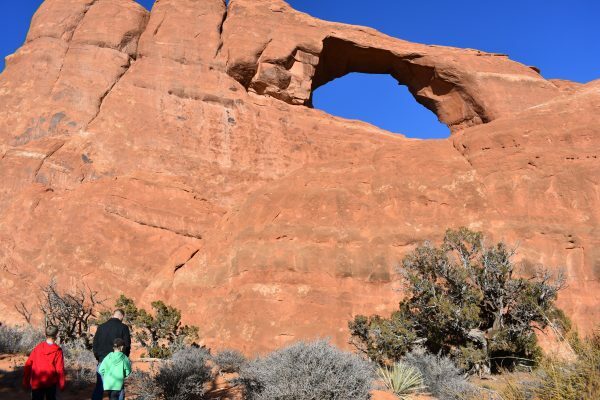 The hike itself is simple and beautiful enough with a great view of the arch. 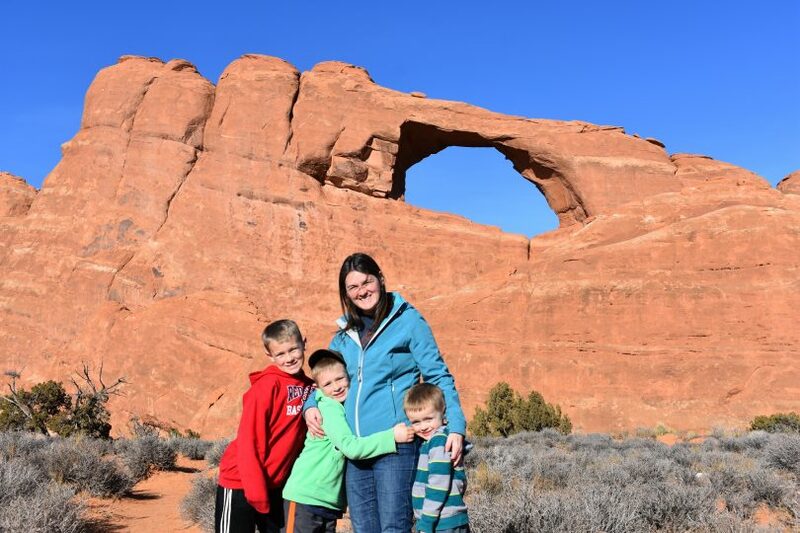 We always love visiting Skyline Arch when we are in Arches.